An elite cast of the nation's best jockeys, led by horse racing's all-time win leader Laffit Pincay Jr. and Pat Day, who is one victory shy of becoming the third member to join the 8,000-win club, will meet again next month in North Texas for the popular NTRA All-Star Jockey Championship at Lone Star Park at Grand Prairie on Friday, June 22. "It's truly an honor to be back at Lone Star Park for the Jockey Championship," said Day, who was at Lone Star Park on Tuesday to announce the elite cast. "This is a special event for all involved. It's always a great night of racing which helps benefit injured and disabled riders." Pincay, a winner of more than 9,100 races, and Day are two of three active Hall of Fame jockeys who will compete in the fifth renewal of the NTRA All-Star Jockey Championship. Jerry Bailey, the nation's leading rider with more than $10 million, is the other. First time invitee Earlie Fires, a winner of more than 6,100 races, will be inducted into the Hall of Fame in August. Bailey and Day received the honor through an online poll - the first time fans had a chance to be involved in the selection process. Nine others were invited by a blue ribbon panel. "It's truly an honor to be invited by the fans," Day said. 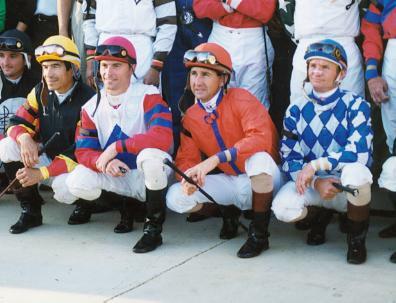 Invited to join the Hall of Fame crew were Robby Albarardo, Ronald Ardoin, Tyler Baze, Jorge Chavez, who rode Monarchos to victory in this year's Kentucky Derby, David Flores, Aaron Gryder and Edgar Prado. Baze, Ardoin, Flores, Fires and Gryder were chosen as all-stars for the first time. Ardoin, a Mid-South legend with more than 5,000 career wins, earned a berth in the 1997 National All-Star Jockey Championship as Lone Star Park's leading rider. The four-member selection panel for the event consisted of industry experts Bill Shoemaker, racing's all-time leader in victories until being overtaken by Pincay; Charles "Chick" Lang, Lone Star Park's senior racing consultant and former general manager of Pimlico Race Course in Maryland; Larry Craft, Lone Star Park's director of racing; and Bob Curran, president of the Turf Publicists of America. Preference in the selection process is given to jockeys who are members of the Jockeys Guild, the cause that benefits from the event. One percent of the wagering on the four NTRA All-Star Jockey Championship races and an "All-Star Wager" goes directly to the Jockeys' Guild Disabled Riders Fund. The Guild, which provides financial and medical assistance to disabled and injured jockeys, also receives a portion of the proceeds from a memorabilia auction, autograph session and golf tournament. The event has raised more than $420,000 in its first four years. Prado is the defending champ in the unique four-race competition. Pincay won the event in 1999. Past winners Gary Stevens (1997) and Shane Sellers (1998) are unable to compete. The inaugural winner Stevens has a commitment to ride in England, which conflicts with the date of the Jockey Championship. Sellers, the competition's career point leader (54), is sidelined indefinitely with a knee injury. As a group, the participants in the 2001 edition of the NTRA All-Star Jockey Championship have won more than 48,000 races, with their purse earnings exceeding $1.1 billion. Bailey, Day, and Pincay were chosen as all-stars for the fifth time. Albarado and Prado are three-time all-stars. Chavez was selected as an all-star for the second year in a row. The 12th and final slot in the competition will go to Lone Star Park's leading jockey through Sunday, June 3. Corey Lanerie, who earned a berth in 1999 and finished second to Pincay that year, enters the week with a 47-33 advantage over Curt Bourque in the local standings. The jockey with the most points at the end of the four-race competition is crowned champion. Riding assignments are determined by a drawing Wednesday, June 20, and jockeys receive points for finishing first (12 points), second (6), third (4) and fourth (3) in each race. The minimum purse for the four all-star races is $30,000. This year's NTRA All-Star Jockey Championship will be televised nationally on ESPN2 at 11 p.m. (CDT). One of the greatest jockeys of the 20th century, Bill Hartack, who won the Kentucky Derby a record five times (a mark shared with Eddie Arcaro), will be the Guest of Honor at this year's event. Born on December 9, 1932, Hartack also won the Preakness three times and the Belmont once. He currently works as a racing official in Louisiana. There will also be a specially designed poster for this year's NTRA All-Star Jockey Championship commissioned by renowned artist LeRoy Neiman. Best known for his brilliantly colored, stunningly energetic images of sporting events and leisure activities, Neiman is probably the most popular living artist in the United States. A display of his legendary artwork will be on display during Jockey Championship festivities and there will be a limited number of autographed event posters. The "All-Star Wager" returns this year. It allows both on-track and nationwide fans an opportunity to place win, place, show, exacta and trifecta wagers on a group of horses ridden by one particular jockey. Each grouping of horses scheduled to be ridden by the same all-star jockey will be assigned a betting number in the program (numbers 1-12).